Wednesday, June 13, Vilnius – President Dalia Grybauskaitė met with King Willem-Alexander of the Netherlands. The King of the Netherlands is on a state visit to Lithuania when it celebrates the centennial of the Restoration of the State. According to the President, Lithuania and the Netherlands enjoy close and sincere friendship. 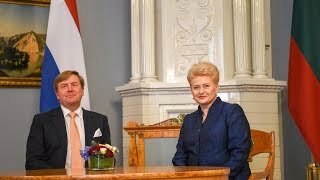 The Netherlands is a reliable ally of Lithuania, one of the key economic partners and a like-minded state in the European Union. The Royal visit is a special manifestation of the Lithuanian-Dutch friendship and an opportunity to boost relations between the two states, their businesses and people. Defense cooperation is in the focus of the visit. According to the President, Lithuania highly values the Dutch troops that are present in Lithuania for a long time to ensure reliable deterrence and enhance security of the entire Alliance. The Dutch troops and equipment were among the first to arrive to Lithuania to make the focal point of the allied forward presence in Lithuania together with the German troops. The President stated that it was paramount now, when Europe had to shoulder more responsibility for security. Lithuania and the Netherlands share positions on closer European defense cooperation that does not overlap NATO. For Lithuania, Dutch effort to improve military mobility in Europe is key. The Netherlands also join the EU Cyber Rapid Response Force formation on Lithuania’s initiative. The President and the King of the Netherlands also discussed bilateral business relations that were on the rise. The Netherlands that enjoy global reputation of tradespeople are one of the main economic partners of Lithuania. Bilateral trade grew by 26 percent last year alone. Now, it reaches 2.4 billion euro. The Netherlands is the second largest investor in Lithuania with investments reaching almost two billion euro. Lithuania is a preferred country for such companies as Booking, which offers hotel booking solutions and plans to create more than 900 new jobs, and different IT companies. When Lithuania began operating its LNG terminal “Independence”, new avenues for cooperation opened in the energy sector. A bilateral Energy Forum that will be held during the state visit will contribute to closer business cooperation between Lithuania and the Netherlands. A large business delegation that also includes representatives from such energy companies as Shell, Gasunie and Nuon Vattenfall, have come to Lithuania together with the King of the Netherlands. The Netherlands are visible in Lithuania in the social area besides defense and economics. The Dutch troops stationed in Lithuania, Dutch businesses operating here as well as the Embassy of the Netherlands have joined the nationwide social campaign “For A Safe Lithuania” launched by the President. They help to create meaningful leisure time for children from care homes and support children day care centers. According to the President, this is a beautiful example of solidarity and social responsibility. The President bestowed a state award – the Order of Vytautas the Great with the Golden Chain – upon the King of the Netherlands. Queen Máxima of the Netherlands was decorated with the Grand Cross of the Order for Merits to Lithuania. The King of the Netherlands awarded the President the highest award of the Kingdom – the Grand-cross of the Order of the Netherlands Lion. State presents were also exchanged at the meeting. The President gave the King of the Netherlands a present of a piece of artwork by Lithuanian artists – the sculptural composition of Vytis and a photo album “Nuostabi šalis” (Splendid Country). The Present of the King of the Netherlands was a unique, authentic 17th century map of the Grand Duchy of Lithuania printed in Amsterdam. Vilnius Žvėrynas Bridge across the River Neris will be lit in orange, the national color of the Netherlands, to honor the King of the Netherlands on a state visit to Lithuania.